This Demonstration uses electronic circuits to model the construction strategies of social wasps. This is an example of a complex biological phenomenon that can be described by equations from physics. You can change the size of the workforce, the capacity of storage or use of material by manipulating different parts of the circuits. The main components are: electron (water) flow, electron (water) source and the circuits (groups of wasps that carry out the same task). See Details for the parameters. 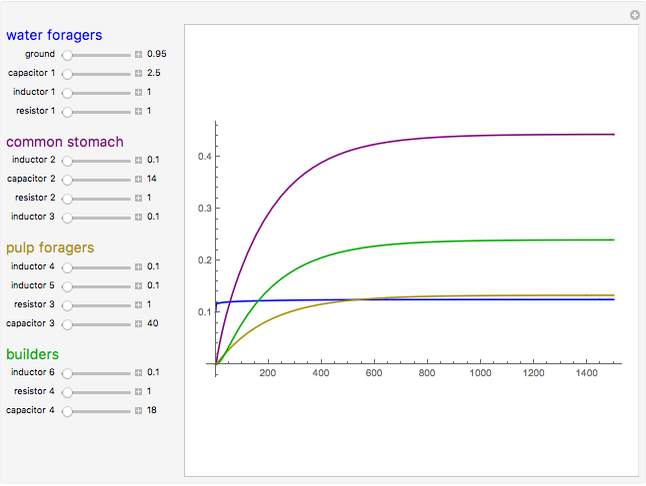 The line graph represents the group size of the wasps (charge of circuits) that belong to the different task groups: water foragers (blue), common stomach wasps (purple), pulp foragers (dark gold) and builders (green). All task groups emerge from nonspecialized wasps. First, the water foragers emerge and carry water to the nest; this triggers the emergence of common stomach wasps that store water. The increased water in the colony triggers the emergence of pulp foragers and builders. Finally, the workforce develops an equilibrium that ensures steady construction. The wasps can belong to one of four task groups. The cooperation of these groups leads to stable construction behavior. The task groups interact via the inductors; therefore, if the charge increases in one circuit, then it propagates to the adjacent ones. 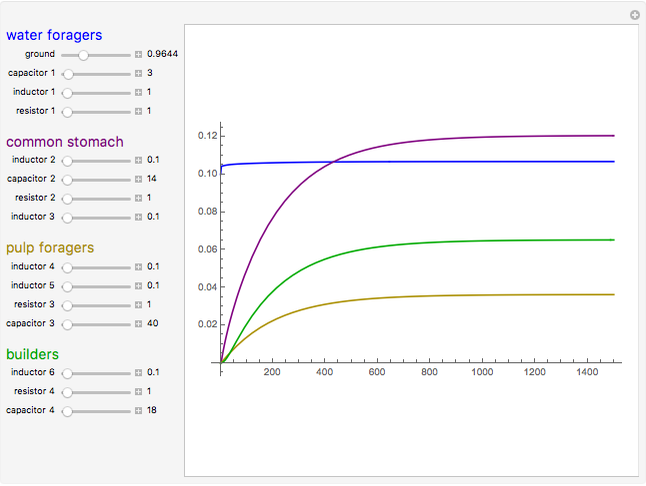 Group size can be altered by changing the capacitors. The resistors represent water used by each group. The main water source is a generator ( ), from which the water foragers collect water. The main water sink is resistor 4, which represents the water needed for the builders to construct the nest. Common stomach wasps temporarily store water and pulp foragers use water to collect building materials. This system is an example of a self-organized distributed system, where different task groups emerge and are dynamically adjusted to reach a steady equilibrium that is resistant to perturbations. 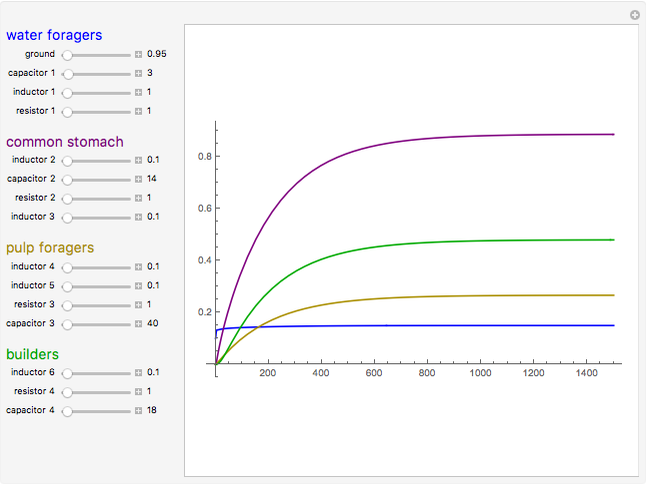 You can vary the main parameters listed in the figure below. These constants in the equations are fixed: (0.1 V) represents the initial charge on the water forager circuit, which is equal to the initial conditions; (0.1 H) is the mutual inductance of the circuit; (1 V) is a part of the electron source of the first circuit to ensure the directionality of electron flow. The figure below is redrawn from . 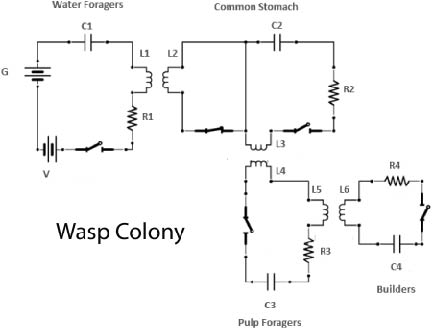 A. Hilbun and I. Karsai, "Task Allocation of Wasps Governed by Common Stomach: A Model Based on Electric Circuits," PLoS ONE, 11(11), e0167041 2016. doi:10.1371/journal.pone.0167041. Allison Hilbun and Istvan Karsai "Task Partitioning in Insect Societies: A Model Based on Electric Circuits"